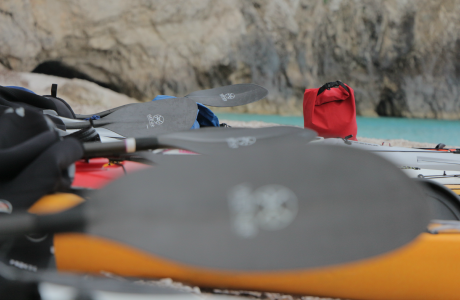 Odysea is an exclusively specialized sea kayak outfitter, offering a mosaic of sea kayak day and multi day trips, as well as sea kayak training courses and bespoke coaching aligned with the British Canoeing educational approach, ethos and philosophy to prospective and developing paddlers all around Greece and abroad. Born in the summer of 2012, Odysea has had a soul long before that. Nowadays it simply incarnates our enthusiasm to share the exploration of the beauty of Greek nature and stretches of coastline through sea kayaking with people from around the world, as well as the thrill hidden in the memorable and rewarding experience of a sea adventure and inspiring personal skills development pathways and hopefully much more beyond that! 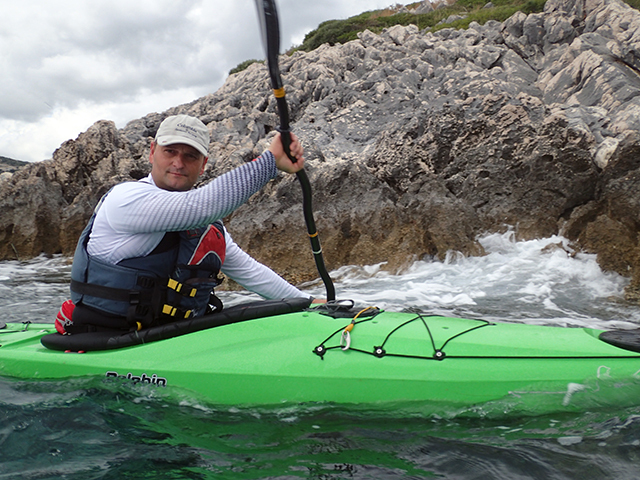 At the helm of Odysea’s journey in the world of sea kayaking is George Gazetas. 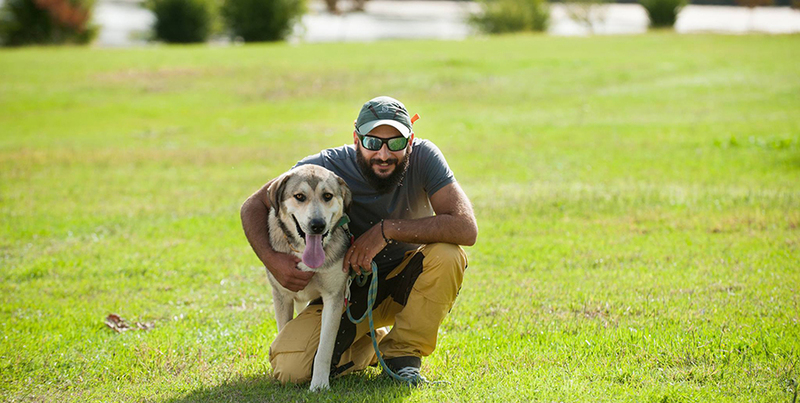 Born in 1984 in Arta, George, while studying Mechanical Engineering, discovered Greece mainly through sea kayaking, which quickly became an important and fascinating part of his life. “I started paddling with a Greenland blade in 2001 and since then I didn’t stop yet. 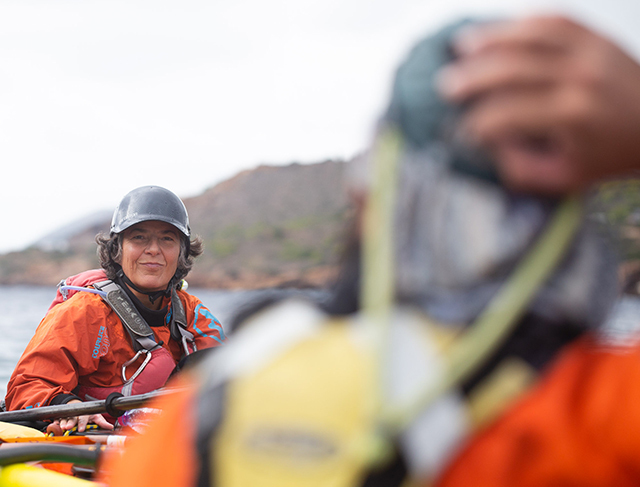 I’m the only woman in Italy who became “Maestro di Canoa” in the national sea kayaking federation. I’m still dreaming about sharing the experience of paddling, journeying and coaching with more women: so I decided to promote with some female paddlers the First Italian Sea Kayak Women Symposium called “The smile of the sea”, that toke place last April 2018 with more women coaches coming from Norway, Germany and Spain. We are working to organize the second edition next Easter 2020 and we’re already excitede about it. I fall in love with the Inuit culture and I’m completely involved in practising and coaching any of the several Greenland roll: for three years I was the promoter of the Italian Greenland Roll Championship and I still prefer to paddle my Greenland stick for all the long sea kayak journeys I share with my partern Mauro: starting from the Highlands in Scotland in 2008, we never stopped paddling around all the Mediterranean Islands (Sicily, Sardinia, Corse, Crete, Evia and also Baleric, Aeolian and Kornati Islands). 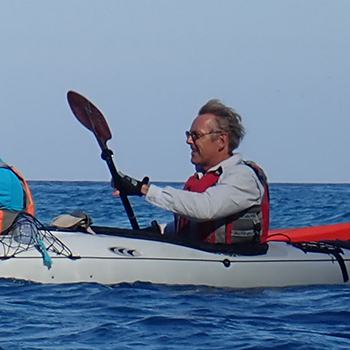 Our last three long sea kayak trips were around every single islands in the Cyclades archipelagos along fine months in 2016, then around Ionian Islands and Peloponnese in 2017, North Aegean and Kalkidiki in 2018: next summer we’re planning to circumnavigate the Dodecanese Islands from Chios on the top North to Rodes in the far South along 4-5 months in the summer time. 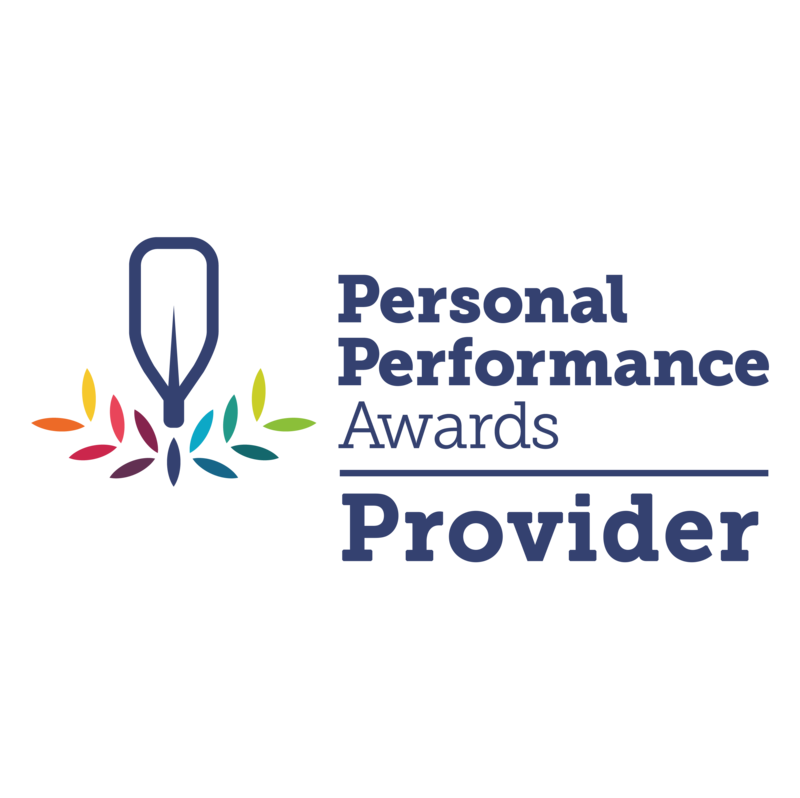 “I was born in 1977, I am a passionate paddler, married and a father to two lovely girls (which I love them as if they were mine!). I have been an active flat water canoe athlete between 1990 and 2004 and member of the National Team from 1993 to 2003 and a National Champion in 1993, 1994, 1995, 1997 and 1999. I have had a rewarding and developing journey in International and the Balkans Championships in 1999. I am a well seasoned and active IRF WW Rafting Guide operating in west Greece. 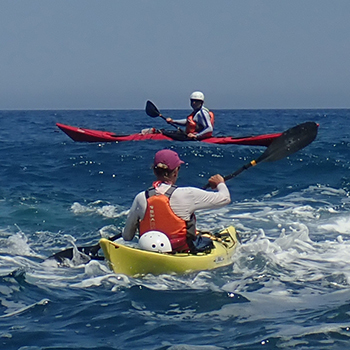 Over the last 5 years I have found myself enjoying both the WW kayaking as well as sea kayaking worlds. I have extensive experience as an active first-responder for Red Cross and I am currently working my way in the British Canoeing qualifications scheme towards becoming a solid and skilful sea kayak leader. I am always focused on providing a great, guest-centred experience in every aspect of my involvement as a guide.” George has been working through the British Canoeing (UKCC) scheme for years, as well as working as a white water rafting trip leader and corporate event coordinator and assistant for a variety of outdoor activities and companies. 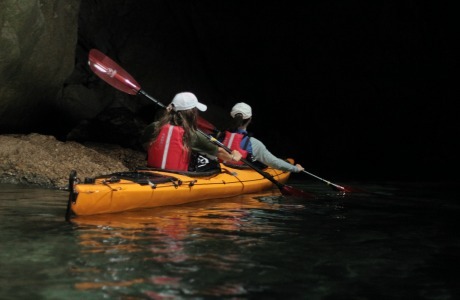 This led George to channel his passion for Greece and sea kayaking into something new – and thus Odysea was created; an enduring fascinating life-journey with the backdrop of Greece’s disarming beauty. George accumulates an experience of more than 10 years in guiding in the outdoors. 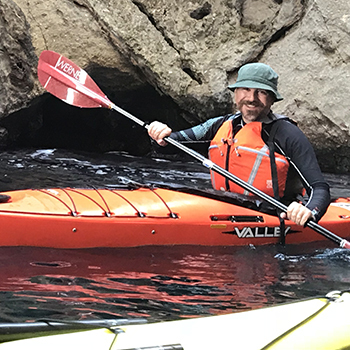 Over the last 9 years, George has been committed to sea kayaking, currently guiding and coaching for over an average of 200 days/year, progressing and developing himself in what he experiences as a blessed journey all the way. Starting a wonderful collaboration in 2012, he is the head coach and guide for SKK team at the island of Kefalonia. 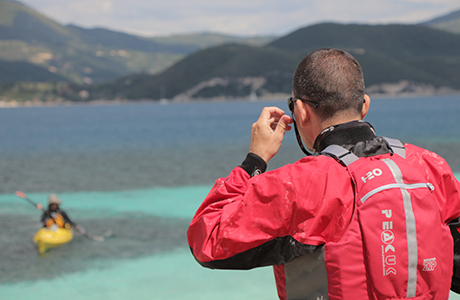 Whether guiding individuals in unique trip-adventures around Greece’s crystal clear and warm waters or sharing the best of his spirit through sea kayak coaching, George runs Odysea with all the passion, professionalism and fun that his experience and personality has to offer. HRC, RTI & EFR First Aid Cert. Greek Army Special Forces Nurse Cert. 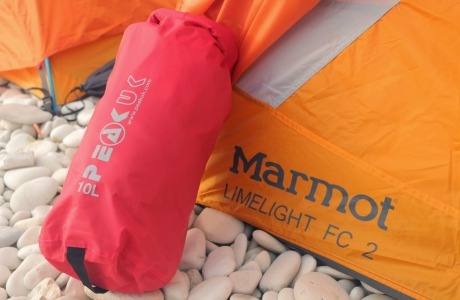 gear from PeakUk, Marmot, MSR, HF, Palm and other leading manufacturers. At Οdysea we strongly believe that quality, in all respects, is fundamental. 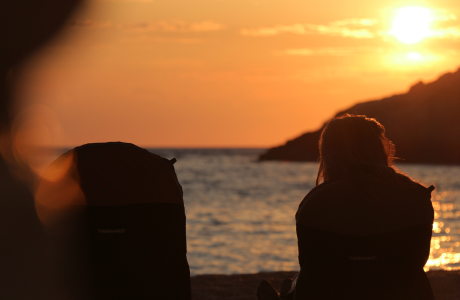 Therefore, we do our best to supply with paddling and camping equipment that meets our high quality standards: Selected based on suitability / best performance, reliability and comfort, our fleet from top manufacturers like P&H, Necky, Valley and Prijon, paddles from Werner Paddles and kit from PeakUk, Hf, Lomo, Kokatat, Palm, Reed and other top suppliers contribute to ensure that we offer you sea kayaking experiences the way we want them to be shared. 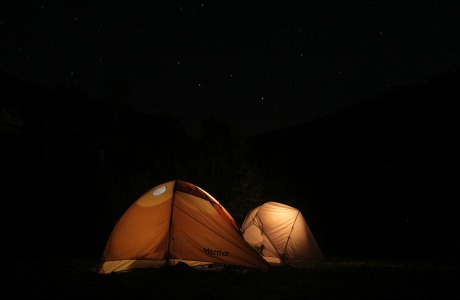 Our camping equipment from MSR, Marmot, Thermarest, 7H means that tents, sleeping bags, mats and the rest of the kits make our wild camp nights exceptionally pleasant and comfortable. 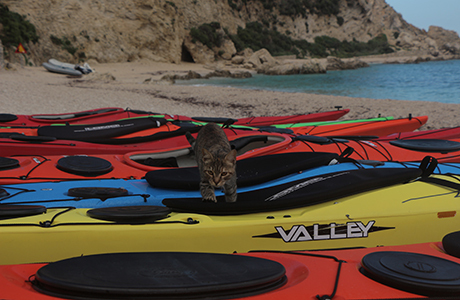 This is the third time I have kayaked in the Greek islands and the first time with Odysea. It was without doubt my best experience due mainly to the organisation, professionalism and friendliness of George and Panos who run the trips. Thanks to both of you, I’ll come again next year if you can put up with me!